Do you remember when I decorated my front room as a living room, and I had such a hard time deciding what the heck to do with window treatments? Well, as I’ve been trying to decide what to do with my windows this go ’round, I’m starting to remember all of the issues I had last time. Last time, I finally decided to go with draperies on the big front window, and Roman shades on the two side windows. But this time, I really have my heart set on draperies for the two windows flanking the fireplace — thick horizontal black and white stripes, like I keep showing you in this mock-up that I did. I love how clean that look is, and I think it would look fantastic on the windows on the fireplace wall. But with that design, the three front windows give me a problem. Here’s a picture I took right after the window installers finished installing the windows, and you can see how the front windows are placed in relation to the windows on the fireplace wall. Because of the weird spacing, I really don’t think I’d be able to do the crown moulding cornice on the front windows also because it would require a strange jog in the crown moulding in the corner of the room. 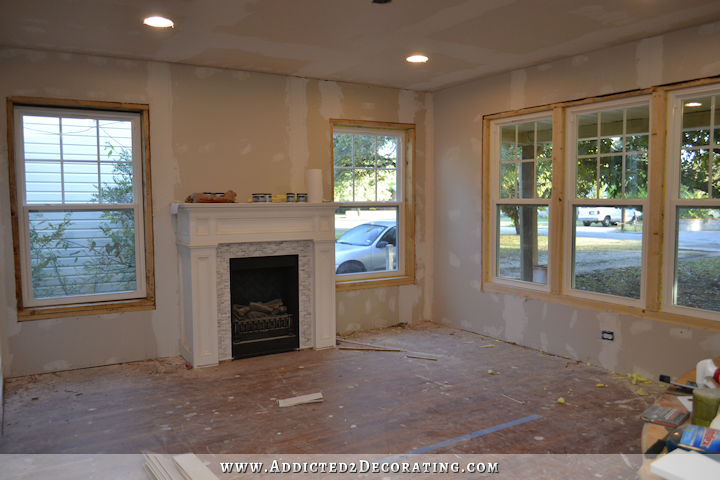 The bumped out crown moulding for the window to the right of the fireplace would go all the way to the side wall in the corner of the room. But then on the front wall with the three windows, the crown would be against the wall for about a foot, and then would bump out to create the cornice for the front windows. I just can’t picture how that that awkward little jog in the corner of the room could look good. So that leads me to my second favorite suggestion, which was to do the casing on the windows the same as my doors, but make the header a bit shorter. And then I could just hang my draperies on curtain rods. Of course, even if I just hang the draperies on curtain rod, the spacing of those windows still causes issues for me. If the windows had the same spacing from the corner of the room, like the corner windows in John & Alice’s bedroom that I decorated many moons ago, it wouldn’t be a problem at all. But the uneven spacing of the windows in relation to the corner is the same issue that I had last time. If I do draperies on all of the windows, no matter how I slice it, the draperies on the front windows are going to stick out and cover part of the view of the drapery panel on the window to the right of the fireplace. Know what I mean? Plus, I’m wondering if that’s just going to be way too much black and white stripe for one room. So all of that to say that I’m back in that same place I was two years ago — considering two different window treatments for the windows in this room. But this time, I’m considering the draperies for the fireplace wall, and something else for the front window. 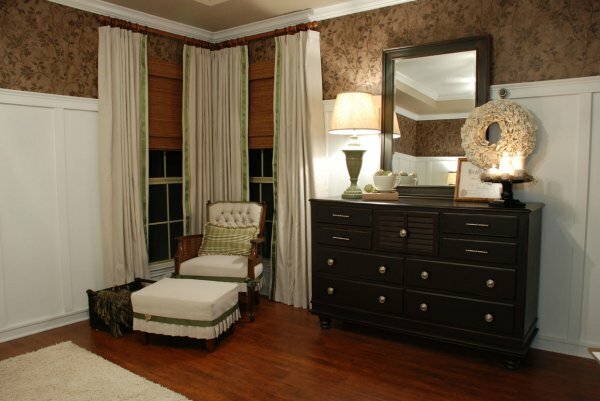 I don’t mind mixing and matching window treatments in a room. Not at all. In fact, I generally like it if it’s done well. So we’ll see. 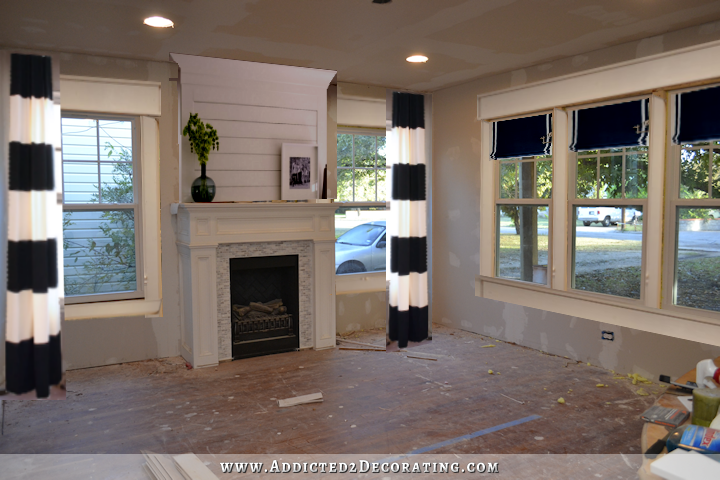 I really like the idea of having the bold striped draperies just flanking the fireplace, and I also like the idea of using a different style of window treatment on the front windows. But I’m having trouble when it comes to the exact style of the window treatment that would coordinate nicely with the draperies. Or I could do a really nice and interesting roller shade. So I’m not quite sure yet, but I don’t want this decision to hold me up any longer. I think I’ll go ahead and do the crown moulding cornice on the windows flanking the fireplace, since that was my absolute favorite option. I’ll go ahead and use the tall header on the casing that matches my doors, and then I’ll make a decision later about window treatments for the front windows. If those front windows weren’t the main front-and-center windows on my front porch, making them the main windows of my house, and if they didn’t give passersby a direct view into my house, I’d actually consider leaving window treatments off of those windows altogether. And coming from me…the window treatment addict…that’s really quite something. But unfortunately, I do need something for privacy at night, so leaving them “undressed” isn’t an option for the long term. EDIT: I did a very quick cut-and-paste mock up of what the room might look like with draperies on the fireplace wall, and Roman shades on the front windows. I just wasn’t able to get the crown moulding above the windows on the fireplace wall, so it still takes a bit of imagination. I think i like it! Doesn’t it seem like there’s ALWAYS a “but” to every “I could”? You do a great job sifting through the buts to make great decisions! As to the front windows, I can see why you’d want the privacy…If I were walking by your house, I’d ALWAYS be peeking in for ideas… though I do know that would be rude…lol. Question… Regarding the draperies for the two windows flanking the fireplace, will you be using a full curtain rod, rather than the small rod shown in the mock-up? I just wonder if the draperies will be functional, rather than for looks only. Either way, I do love them! what if you do not make the draperies functional and use like bamboo shades as the way to cover the windows. How deep does the cornice need to be to accommodate the folds of the draperies when fully open? Could you run the cornice on the side wall right up to the front wall, then do one on the front that butts up to the first? That would give a mitred appearance once it’s painted out but allow both panels to move as fully as possible. If the fabrics sort of puddle together in the corner you’ll end up with an asymmetrical version of John and Alice’s corner treatment without a hard line delineating one panel from the other. I think, since there’s so much wall between the side of the front window and the corner, that your folds don’t need to be very deep and thus wouldn’t cover all that much of the side window panel. I love this idea, it has such a beautiful of window treatments. There is no bumping in and out on the crown. I like this idea. 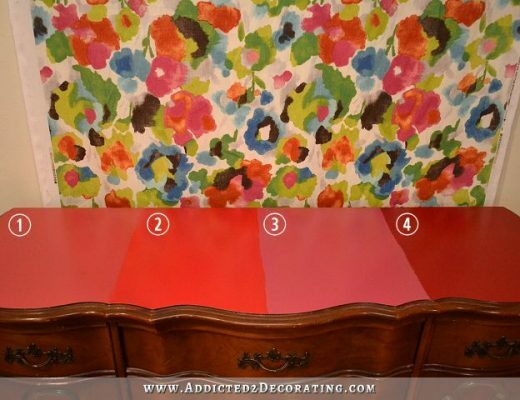 But, my favorite is to just do regular crown and regular curtain rods. I think it would look splendid that way. And, I think there will be plenty of room. (at least it looks like there will be to me.) Also, I would do the long curtains on all of the windows. IMHO it would look so much better to have the same window treatments. But, I’m sure you will make it work whatever you decide. my thoughts too and I do not or can not see what she is talking about with the draperies on the front windows are going to stick out and cover part of the view of the drapery panel on the window to the right of the fireplace. to me it would be so much harder to change drapery style with the cornice. I completely agree that as long as it’s done well, and looks “intentional,” there’s no need to have the exact same window treatments. Actually, I think that it can look even more sophisticated since it’s not so “matchy-matchy.” And I love the high-quality Roman and roller shades you’ve used as your examples. Just one thing to ponder: shades on multiple windows have their own issues. Will your triple window have enough inner structure to accommodate inside mounts? And will it drive you crazy trying to keep 3 shades level? I think those are good questions – and suggest the reason that shades are usually done on the smaller windows in a room and draperies on the large ones. I think that despite your desire to do draperies on the windows flanking the fireplace that roman blinds or shades are really the way to go there and leave the black and white striped drapery for the picture window. The fireplace wall already has a dominant feature on it and adding the drapery to that wall will, in my opinion, add an extra layer of detail that will look cluttered rather than clean. There’s a reason that solution is the classic one we see in most spaces that have window configurations like yours. Agreeing with Julie and Carswell. I have Roman Shades throughout my home and making sure the dining room and the living room are all on the same level is a pain! Also agree about the fireplace already being a focal point so why take away from it. Well done drapes (as you do so well) on the front windows would seem the way to go with the window header rising above the rod. Then again, in my home, I’m getting ready to switch out bamboo roman shades (only perceived privacy if not lined well) for lined, insulated fabric Roman shades in all windows! A wholeheartedly agree with you gals. And, while I can picture this type of window treatment/moulding in homes with much larger rooms and taller ceilings, I don’t know that this type of crown moulding window treatment seems right for your house. Seems a tad elaborate and not quite in keeping with your little jewel box of a house. Agree with Laniece and Carswell. I open the 3 blinds of our 9 ft window every am and they HAVE to be even! I’m not that crazy about the black & white b/c the pattern is so busy and iit would overly dominate the room–if there were only a couple of windows, it would be different. BUT–it’s your room! I agree. There is better balance with the longer draperies at the triple window. I am just enjoying the ride. I love that you share your thought process with us! Can’t wait to see what you decide. I’m a little confused by the “jog” you mention in the bumped-out crown idea. If I’m understanding you correctly, you want to do the bumped-out crown PLUS a cornice on the front windows, so maybe the cornice is the jog? What if you omitted the cornice and just hung the front drapes behind the crown molding the same way the side windows are in that sample photo? That way, the crown would be the same distance out from the wall all the way around the room (kind of like a tray ceiling soffet with the drapes inset in it). Something else I thought of… what if you used shorter crown molding than you use elsewhere in the house? Maybe a chunky cove/quarter molding. I’m not sure how this would look in relation to the rest of the rooms, but it is another way to save an inch or two in height. Sounds like you’re beyond that problem, though. Would shutters work at all in your design on those front windows? Then they’d kind of just fade away but give you privacy or the light control. And let the fireplace wall really be the showstopper? I just saw some (white/wide) in a newly remodeled house, and they really looked fantastic. Love love what you’re doing! Treatments hung the same way (it would stick out if one rod is hidden while other exposed) and for the front wall, when you enter home you won’t look up and see space between upper wall and cornice sticking out to where you would be able to see the ‘hidden’ curtain rod. 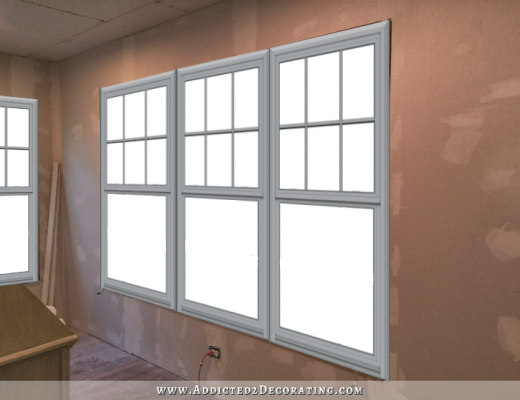 With you doing your idea of regular crown mounding flanking the front windows and cornice crown moulding just above Windows, you’re creating a nice clean look. What I enjoy about your reno is if you’re not pleased with finish product, you are willing to start over. Your bookcase/sliding doors look amazing. And the redoing of entry to music room looks excellent. Great work! Jessica, unless I missed something, I think Kristi is still planning to use the striped drapery panels. Years ago I built out a portion of a wall to do essentially what you want to do with the crown moulding. I used a drapery rod system called safe snap by accent draperies in Ohio. Super easy and functional! Doesn’t take up much room, either. Hi Kristi Annette from Tennessee. What is your app or site you use to put up a picture and try out different designs to see how they look? I love your idea for the draperies on the end wall. 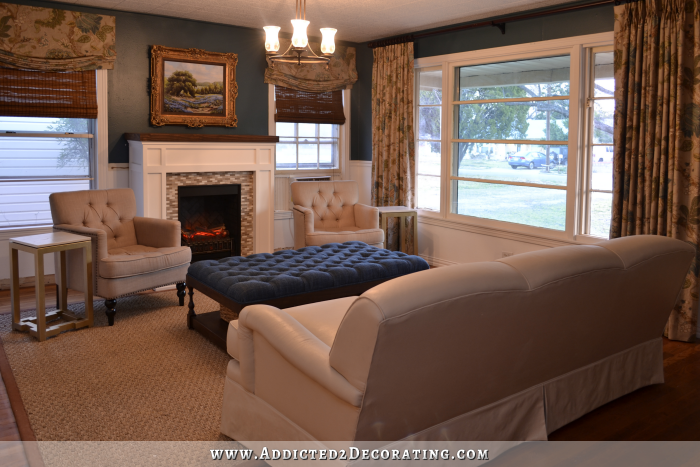 They will highlight your fireplace and moulding. The black roman shades with white trim should work nicely on the front windows. They can be open and allow a lot of natural light into the room and then shut when you need privacy. If I recall from a while back you mentioned doing some planking over your fireplace. Just wait for your window treatments until you finish that job. I think once it’s planked and finished, along with the crown mouldings you will get a very clear picture of what your window treatments should be. I enjoy your thought process and how you share them with your readers. Everything you do inspires me to continue with jobs I used to consider to tough for a woman. Thank you for giving woman strength to believe we can do anything we put our minds to. I’m confused about why you would have a jog in and then a bump out for the crown above the front window. Couldn’t’ you just extend the bumped out crown from the corner over the windows? Then you don’t have it go in and come back out for the windows only. It may mean a simple return elsewhere in the room on the other side of the front windows since I believe this wall is shared with the front door and another room, is that correct? If there isn’t another room to the side of the front door couldn’t you extend the bumped out area of crown all the way along that wall and then do the rest of the crown along just the wall without the bump out? I don’t think that would look bad at all. I’m not sure about the concern of the front window treatments blocking the side windows. I mean, I get what you are saying but I don’t think it would be such a big deal, especially if they are the same curtains. The only time you might really notice that they block the side window is if you are looking at the side of the room dead on, from most vantage points in the room you wouldn’t really see it that well. The plan is for this to become a dining room, correct? The main vantage point will be from the table and from there it would not be as noticeable that the front drapes hide the side ones. From the front door I think you would always get a bit of the side drapes hidden by the front window drapes. If the drapes were hung the same way and the lines all matched up on your stripes for all the windows when hung, I don’t know that anyone would even notice that the front window drapes hide the side ones a bit at all. The brain has an awesome way of seeing the patterns that are very similar and making them line up so honestly I think as long as the stripes all pretty much lined up from the side to the front windows they may appear to the brain to be continuous even though there is a small gap in the corner. Of course this is much less likely to happen if the drapes for the front window are hung a bit lower and the stripes don’t line up pretty well. Shutters are so nice for light and privacy. They would go well with your traditional touches and let the fireplace wall be a focal point. In your inspiration pic, why do the black and white panels have to hang away from fireplace into the corners? What about letting them hang close to the fireplace, then your front wall of windows, continue with a panel for the corner and then one on each side of the center big windows? Wouldnt that make it look like the windows wrap around room? I think the black and white curtains are really fun and I get why you want to use them. However, I think they distract from your beautiful fireplace. 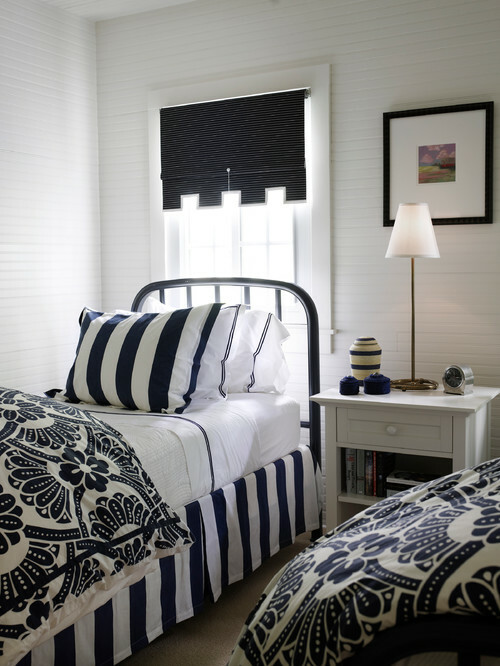 I like the black roman shade w/ the white ribbon idea. I would do that on all windows and have a black/white bold rug for fun. The Vanderbuilt living room looks the nicest. The cornice crown curtain combo looks practical, but fussy and a bit old fashioned. I agree – I think the roman shade with the white ribbon would look really smart on the side windows – and then let the full black and white draperies on the picture window shine. Can’t wait to see where you end up (b/c I know it will be great regardless). Please keep us posted on any plans to “dispose” (sell) of the Kaufmann (Floribunda?) panels/shades. I’d love ’em! What about a reverse mounted roman shade on the front windows? From the bottom up? That way, you have your beautiful, undressed windows for daytime, and they close UP (pun intended) in the evenings? I vote for the shades on the two side windows and drapes on the front windows! 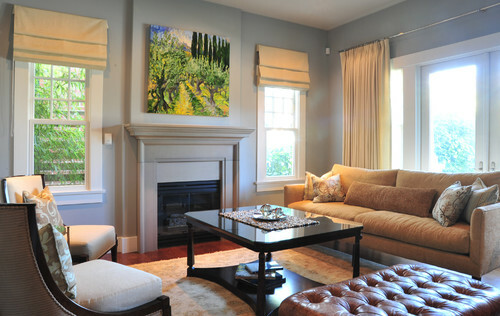 Funny how the “Traditional Living Room” by Vancouver Interiors is set up almost like your living room! Oops – I forgot – it’s now a dining room! I was going to say this also! Shades on the windows flanking the fireplace, and curtains on the main large bank of windows. Love your last option! Makes the front look open and airy…modern traditional cuteness! I have no advice. Several times I’ve thought you were moving in a direction that would be too busy, but they’ve all turned out beautifully. So I’ll wait and see your clever solution for your windows! I guess that’s why you’re writing the blog, and I’m reading it! My house seemed dark and dreary no matter how light I painted or what I did with window treatments. The ticket for our old ranch was recessed lighting. Adding recessed lights in addition to the main ceiling light improved the feel of the rooms. How about the horizontal stripes on the small windows like you have and vertical stripes on the front windows using the Roman shade? I LOVE the edited version! i like the edited version and i hope you will not do the bumping the crown moulding away from the wall a bit to create a cornice. it looks like it would be to much. When you mentioned curtains on the small windows and shades on the big one I thought … ok… well what ever. But now that I see you last picture there….. IT IS STUNNING!!! PLEASE PLEASE PLEASE do it that way. LOVE IT!! Cuz don’t you think the stripes on the big window may be too much?? Any ways this idea is nothing short of brilliant! Thanks for sharing your adventure with us all! Some very interesting comments. And mine I favour black Roman blinds with white trim on the small windows,then the strip on the big windows. But I’m sure. You will come up with a solution that suits you. Thanks for always sharing your thoughts. Look forward to a happy outcome. When I returned home tonight, I saw there were more reader comments, so I’m reading them and realizing that you must have edited your original post from this morning. So I scrolled up to see your Edited version and Wow, does that look fresh and welcoming! It is exciting but not overbearing. Beautiful!!! Not that I’m any expert, but I think it looks great! I like it too, it was just what I was thinking when I saw your (incredible) thought to leave the front windows with no treatment at all! You get what you want, the fireplace flanked by the drapes and it looks beautiful all around. I understand how it feels when you get dedicated to a notion like flanking a fireplace with drapes and not being happy with anything else. I think the roman shades on the front long great! I too, wish my front windows could go nakey, but we need something up for privacy. I’m excited to see how it comes together! I love the black and pink Romans in the photo; I know yours would have a white ribbon though. I love the inside mount, and large header. I think they’d look sensational on the FP windows and the striped curtains on the front ones. I love all of the research you do. Good luck! Hello from Canada! I love your blog and think you do amazing work! My first thought on reading about your dining room was keep the cornice and drapes idea by the fire place and use shutters on the three front windows. Just a thought. Good luck with it all. Can’t wait to see how it all turns out! What if you flip it and put the curtains on the front windows and the shades on the windows next to the fireplace? Then the curtains won’t cover 1/2 the window. ??? Just a thought. I’m having a little bit of trouble reading the comments on the new format of your posts_ so excuse me if I missed a reply that is similar to mine. I love the color scheme and the overall look. What a transformation from the temporary living room design. My comment is about the ribbon on the Roman shade. The fact that it is vertical and the drapes are horizontal stands out to me. 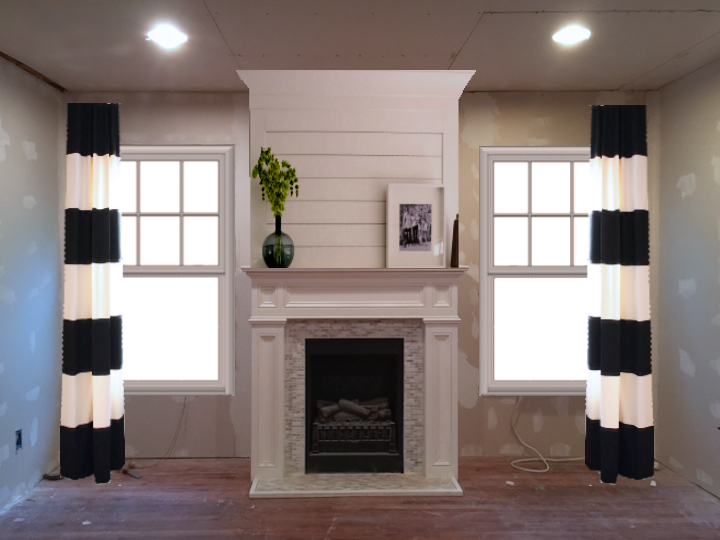 With all the wide window casing and crown molding, have you thought about having the shade and the ribbon both black? Why not just use the cornice idea all the way around the room? You can then tuck the curtains in the corner when not in use.